I discovered a copy of this very rare book, originally published in London in 1872, at the British Museum, reference MS 10921.aaa.23, when reading the History of the Sappers and Miners by Connolly. I had never encountered this book anywhere, and I obtained a copy from the museum. However, by one of those strange coincidences of life, I received a message from Richard Brown of Ken Trotman Books that very week, offering a copy of a book that he had never come across before, which I might like to add to my ‘Collection’. It of course turned out to be an original of the very same book by Lieutenant John Sperling! I deemed from this omen that I was meant to work on this book and jolly glad I am to have done so as it is a cracking little book, from a corps which has little published source material from the Holland (1814) and Waterloo campaigns. John Sperling was a son of Henry Piper Sperling and Sarah Anne (nee Grace) of Rectory Manor in Tottenham. Lord Malmesbury auctioned the estate of Park Place in Remenham near Henley on Thames (now a school) in 28 Lots at Henley Town Hall in 1815 with the house being purchased by Henry Sperling for £32,000. Mr Sperling only lived at Park Place a short while before exchanging the estate in 1824 for Norbury Park in Surrey with his cousin Mr Ebenezer Fuller-Maitland M.P. John Sperling (1793-1877) was a lieutenant of Royal Engineers, he was born at Tottenham on 4 November 1793. After passing through the Royal Military Academy at Woolwich, and spending some time on the Ordnance Survey of Great Britain, Sperling received a commission as Second Lieutenant in the Royal Engineers on 14 December 1811. He joined his corps at Chatham in March 1812, and was promoted to First Lieutenant on 1 July 1812 . In December 1813 Sperling embarked at Ramsgate with the expedition under Sir Thomas Graham to assist the Dutch oust the French, whose garrisons had recently been much reduced in strength. They landed at Willemstadt and soon Sperling was at Standaarbuiten making a bridge of boats and a tete-de-pont which protected the passage of that river. On 8 March an attempt was made to storm Bergen op Zoom with four columns of attack. Sperling headed one column with Colonel Carleton, which effected an entrance by surprise, but not being supported by the main body and encountering a large force of the enemy, it was obliged to fall back after the death of its commander. Sperling is an important eyewitness to the movements of this column and his description is one of the best available regarding this failure grasped from the jaws of victory. On 23 March Sperling was appointed adjutant and quartermaster of the sappers and miners, and he accordingly joined headquarters at Kalmthout. But on 11 April news arrived of the entrance of the allies into Paris, and of the change of government, upon which hostilities at once ceased. When the news of Napoleons escape from Elba arrived Sperling’s work became very onerous. In April he visited Ghent in regard to the defence works for a bridge over the Scheldt and then accompanied Colonel Carmichael Smyth on a tour of inspection of the works at Ghent, Oudenarde and Tournai. 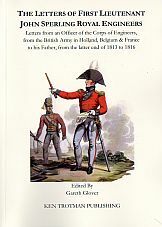 On 15 June the French crossed the frontier and Sperling joined Colonel Carmichael Smyth on the 17th from Antwerp and found the British army falling back after the battle of Quatre Bras. That night Sperling rode to order the sappers stationed at Hal to build defensive works at Braine l’Alleud, then on the next day he and Carmichael Smyth accompanied the Duke during the early part of the battle of Waterloo, but owing to their various duties, they were separated from Wellington, but Sperling remained, for the most part on the crest near the artillery, occasionally taking refuge in the infantry squares. On 19 June Sperling returned with Smyth to Brussels, he then moved with headquarters towards Paris. On 2 July he visited Argenteuil, Bezons, and Carrieres, to report on their comparative eligibility for bridging the Seine and Argenteuil was selected. On 7 July Sperling entered Paris with the headquarters staff. He remained in Paris until 27 January 1816, when he was moved to Cambrai. Sperling returned to England in November 1818, and retired on permanent half pay on 24 January 1824. He married Harriet Hanson and had a son John in 1825. He resided first at Great Doods, near Reigate, Surrey, and afterwards in a house which he built for himself at 16 Kensington Palace Gardens, London. He died at Kensington on 13 February 1877. The book is actually a compilation of the letters John sent home regularly to his father, which were themselves written in the form of a diary, with a short passage entered each day describing that days occurrences; a new letter beginning as the previous was eventually posted. Hence they are fresh, vibrant and instant; no danger of the dreaded ‘hindsight’ here. And although Sperling worked on the letters for publication later, it is clear that he did so thankfully with a very light touch and has left the original feeling of immediacy intact. One should not have to apologise for anyone’s religious beliefs but it is clear from the writing that John Sperling was a devout Christian and occasionally his narrative can be halted by an interjection of devout Christian rhetoric I have decided that its continued inclusion is necessary to fully understand the man and his raison d’etre. I have found John Sperling’s account to be fascinating, enthralling , informative and enlightening, I do hope that you agree.